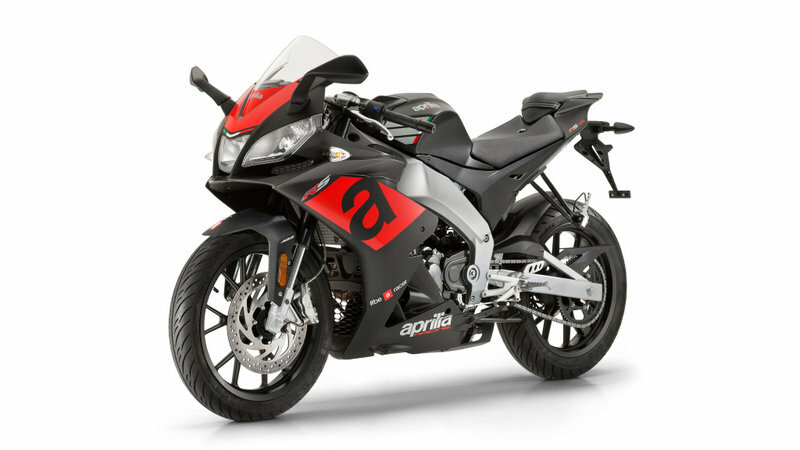 Aprilia doubles down on its campaign to draw new and young riders into the sportbike sector with an extensive redesign of its proven entry-level ride, the RS 125. Previously powered by a carbureted two-stroke plant, the new Euro 4 emissions standards forced a shift to four-stroke power with electronic fuel injection to control the mixture. 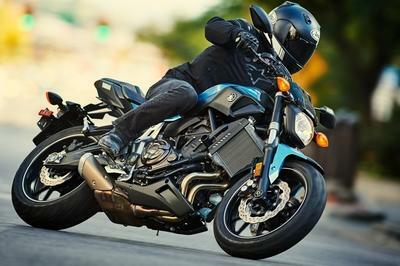 The race-tastic form associated with the family is carried into this new generation, ensuring that this ride continues to appeal to riders looking to break into the sportbike sector on an unintimidating platform. 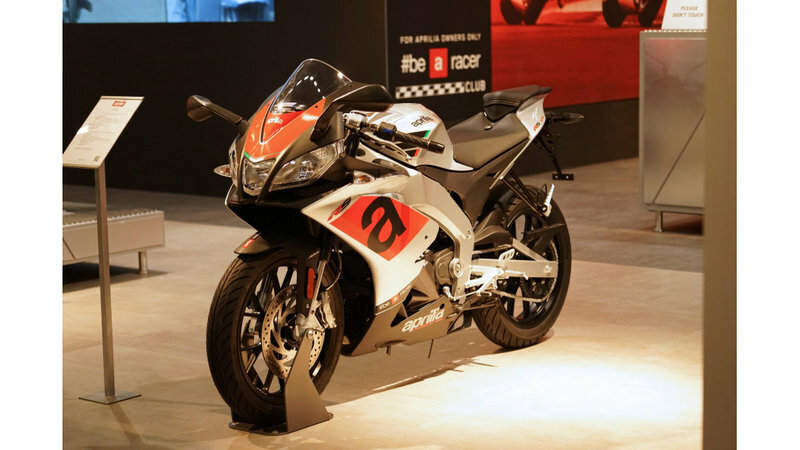 Aprilia released the rehashed RS 125 at the 2016 INTERMOT show, and now I make good on my promise to take a deeper look at it. 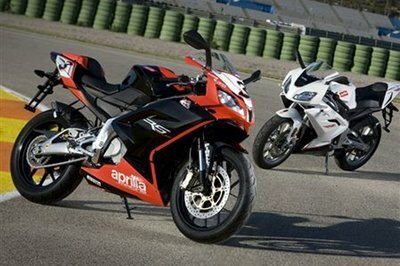 Continue reading for my review of the Aprilia RS 125. As with the previous models, this newest iteration looks like it just came out of the pits with its aggressive, nose-down stance, racy livery and supersport panache. OK, so it may be going it a bit high to assign the word “super” to anything with such a diminutive mill, but even Ray Charles could see the RSV4 DNA in the little RS 125. The pointed entry of the front fairing houses a trio of forward-facing lights with a clear windshield that’s just big enough to steer the wind over your head when you tuck in. Below that, the fairing opens up in a scoop that channels ram air over the radiator, and further accentuates the bike’s sporty style. Since mobile devices are absolutely ubiquitous nowadays, Aprilia added a storage compartment capable of stashing up to a six-inch tablet with a USB port for charging purposes. The upper lines are typical of the genre, and the blocky fuel tank, scoop saddle and kicked-up tail fit right in. An aggressive rider triangle puts the rider in the jockey/Superman position, and indents in the rear of the fuel tank leave room to tuck ones knees in and throw about some proper body English as well. 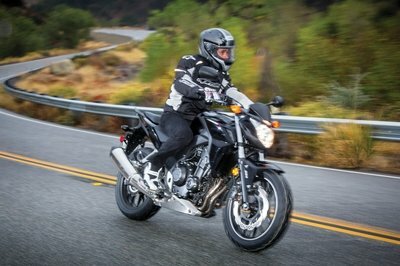 In short, it seems a right proper little trainer for someone aspiring to rip about on curvy roads atop a more powerful and larger “big-boy” machine. An aluminum perimeter frame serves as the skeleton, and the exposed die-cast spars along the sides add yet more to the racy style while keeping weight to a minimum. 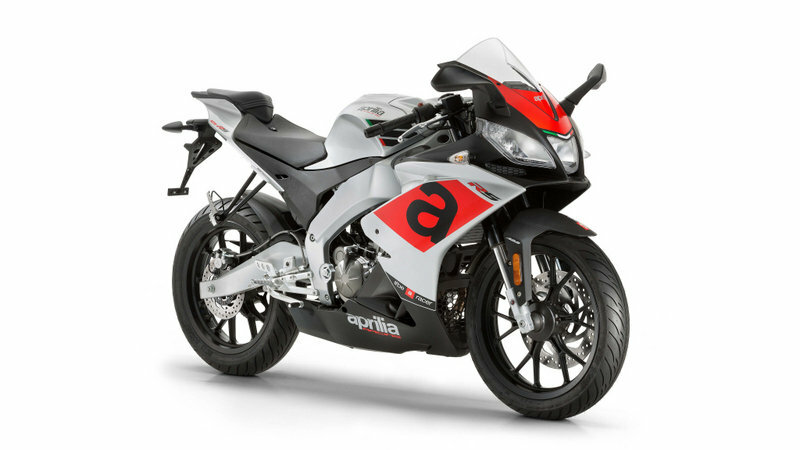 Aprilia claims “textbook agility and handling,” and the bike certainly looks like the handling is razor sharp, but the factory initially offers no metrics on the steering geometry so it’s hard to say exactly how textbook it really is. The asymmetrical swingarm completes the standing structure, and it comes with a boomerang shape on the right and split on the left to accommodate the final-drive chain. A centrally mounted, coil-over monoshock springs the swingarm with 4.72 inches of travel, but comes with no sort of adjustability so you can forget about dialing in the ride. Usd forks buoy the front and fit the look of the higher-tier struts. While they give up 4.3 inches of travel, they come with fixed compression and rebound values and thus aren’t quite as versatile as one could hope. To be fair, what it has is probably good enough for 99-percent of new riders out there, and this is an entry-level bike, after all. Cast, split-spoke rims mount the all-around 17-inch hoops with a 100/80 leading the way and a 130/70 bringing up the rear. A four-pot, opposed-piston caliper binds the 300 mm front disc with a single-piston caliper to bind the 218 mm rear disc with ABS included in the standard equipment. Probably the biggest difference with this revamped family involves the powerplant. While the previous generation ran with a two-stroke engine, its successor packs in a cleaner, liquid-cooled, four-stroke thumper. The one-lung mill is slightly oversquare with a 58 mm bore and 47 mm stroke for a total displacement of 124.2 cc and a relatively warm 12.5-to-1 compression ratio. A 32 mm Magneti Marelli M3G throttle body replaces the carburetor to help meet Euro 4 emissions, and a simple capacitor-discharge ignition tends to the spark with dual overhead cams to time the four valve head. Thumpers have a (deserved) reputation for putting off some ferocious vibrations, but Aprilia took steps to temper that a bit with a balance shaft. While all this is fairly vanilla, the factory surprised me with a Quick Shift function on its six-speed gearbox that interrupts the spark for clutchless shifting. All very track-tastic, don’t you agree? The obvious choice would be the RC 125 from KTM, but that’s really done to death. Let’s go outside the box a little. Based on engine size alone, something like the Honda Grom or Kawasaki Z125 PRO fits the bill nicely; too bad the overall attitude is all wrong. 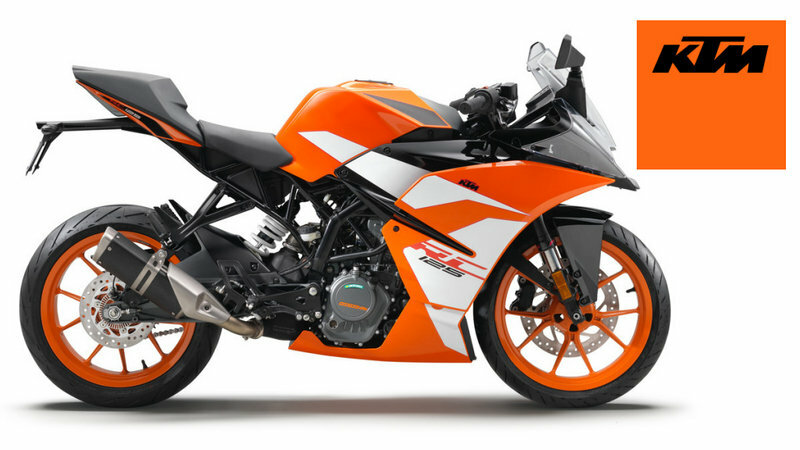 True sportbikes with such a small engine are hard to come by, especially outside the EU in which strictly tiered licensing creates a market for such rides. 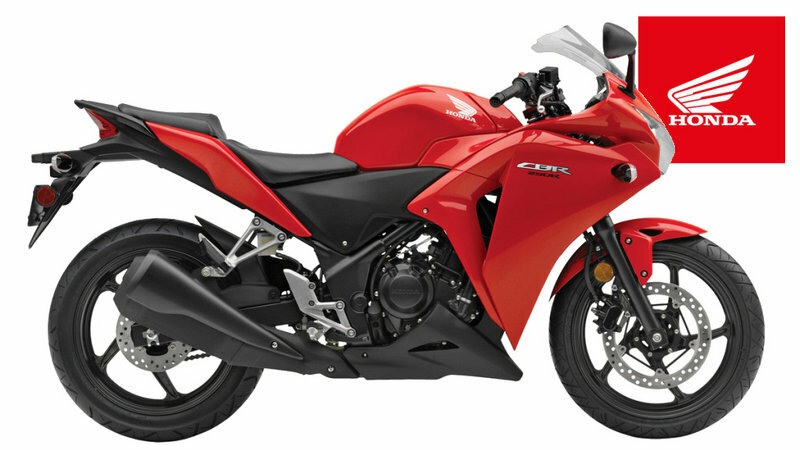 Finally, I revisited Honda and settled on its racy CBR250R. In spite of the difference in engine size, both of these bikes are zeroed in on the entry-level market and built to be rider friendly while maintaining a racy panache that would look perfectly at home trackside. Honda ramps that up a notch by offering the CBR in its Repsol livery, and I for one think it looks as sharp as a rat’s turd. Beyond that, there isn’t much to choose between the two in that department, and both look like serious business. Like Aprilia, Honda opts for a non-adjustable front end, but does offer adjustable preload on the rear shock for a slight advantage in suspension. Brakes are close enough for government work, and ABS is available across the board. 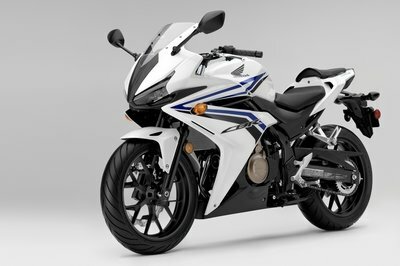 Obviously, the 249.6 cc Honda plant is going to be a bit more thrilling than the 124.2 cc Aprilia, but honestly unless you are racing them against similarly sized competitors, you will likely outgrow either one of these bikes fairly rapidly as your skill level rises. One big boost for Aprilia is the Quick Shift, something Honda has no counter for on its smallest CBR. My wife and fellow writer, Allyn Hinton, says, "Sometimes I agree with my husband and sometimes I disagree. 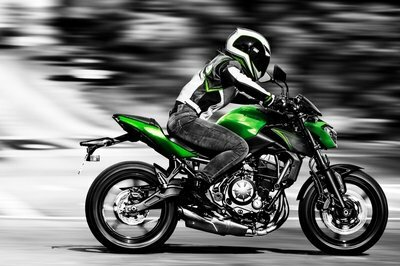 His general feeling is that no one would want a 125 cc bike for any other purpose than to learn to ride. The market for these smaller bikes is becoming more prominent and the RS 125 fits right in. It’s sporty — a peg-dragger bike, not just a race look-a-like — so yeah, it could be a trainer; but I also like to think that as a commuter or just a weekend-fun bike, people are gonna love their 125 cc bikes. I feel like if you have to carry anything — books, for example — a tank bag would be better than trying to bungee something to the pillion."